Two shorelines create a vast bowl around the waters of outer Edgartown harbor and Nantucket Sound, and, at first glance, the bluffs and beaches on either side look much the same. Around this bowl (coastal scientists and engineers call it a cell) the water moves in somewhat contained and predictable ways. But that’s where the similarities between the two coastlines end, and the challenges and costs to hold both in place begin to diverge in radically different ways. On the Martha’s Vineyard side of the cell, the coastline curves about six miles from the headland of East Chop to the fat, hooked thumb of Lighthouse Beach at the entrance to Edgartown harbor. On the Chappaquiddick side, the shoreline arcs smoothly over four miles from Cape Pogue to Chappy Point, also at the harbor entrance. Scientists, engineers and waterfront workers say that sediment mostly circulates within the cell rather than wafting out to sea. And though people have long tried to control the processes by building seawalls, jetties and groins and nourishing some of the beaches with sand — the bluffs at both Vineyard and Chappy headlands are eroding and the beaches are folding inland just as in other places around the Island. The effort to keep these shorelines in place has cost millions of dollars in the last three decades and the price is climbing. Whether Oak Bluffs and Edgartown can afford to keep paying as the sea rises and the shoreline retreats in generations to come is the overarching question on the Vineyard side of the cell. On the Chappy side, the question is whether mostly wealthy but independent-minded homeowners can work together to try to lock down the coastline they share, as well pay for the work. Steve McKenna, regional coordinator for Cape Cod and the Islands at the state Office of Coastal Zone Management, understands that town and private beaches are key to the seasonal economy of Oak Bluffs and Edgartown. But custodians of both public and private beaches all around Massachusetts are starting to worry about costs, and he thinks Oak Bluffs and Edgartown may begin to worry too. “And private property owners, I think, are going through the same thing: unless they can armor [the shorelines they own], they’re pretty much in an unsustainable spot if they don’t have a lot to move the house to. Some of those owners have to make a decision, [which could be] we can’t afford to sustain this property." As with the rest of the Island coastline, the bluffs at East Chop as well as North Neck on Chappy are fracturing, slumping and siphoning sand down to the beaches. Though walls and riprap armor the cliffs at East Chop, and terraces and bulkheads fortify sections of North Neck, the outer harbor and Nantucket Sound keep finding ways to dig into the bases of the cliffs, which are still managing to yield some sediment to the beaches below them. At the northern ends of both the Vineyard and Chappy coastlines, embankments slant upward above the outer harbor and sound. They are made of sand, earth and clay, patched with ragged vegetation. Heading south, jetties and groins stud the beaches. Sand flats spread shallowly beneath the water, showing how carelessly nature regards the difference between shoreline and shoal along the eastern half of Martha’s Vineyard. Whether nourished artificially or not, the beaches on both sides are also retreating in response to the rise of the ocean. For the most part, studies show, longshore drift is carrying sand from the bluffs and beaches southward, so that down at the entrance to Edgartown harbor — the bottom of the cell — the shoreline is widening, sometimes at remarkable rates. Here is where the uses and perhaps in coming decades the fates of the Vineyard and Chappy shorelines head off in sharply different directions. On the Vineyard side the public enjoys the longest and most accessible beaches on the Island by far, among them Inkwell and Pay beaches at Oak Bluffs and Joseph A. Sylvia State Beach, which Oak Bluffs and Edgartown share. Edgartown and Oak Bluffs want to keep the two-mile length of State Beach wide, stable and inviting. Their seasonal economies depend on it. As a result, the beach has become more engineered than natural over time. “People won’t complain about [artificially] nourishing this one, in part because it’s entirely public. 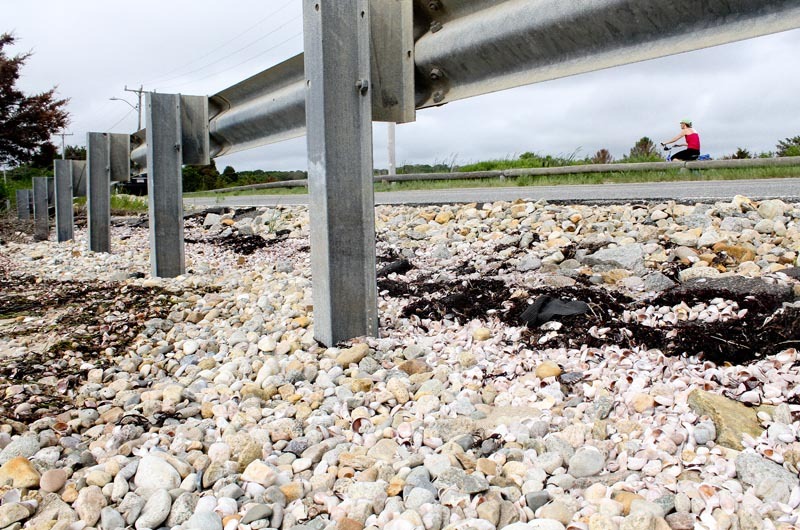 And you’re not seeing those long-term erosion rates that you’re seeing on the [Atlantic] side,” said Greg Berman, coastal processes specialist at the Woods Hole Sea Grant and Cape Cod Cooperative Extension. He expects the two towns to do whatever it takes, for as long as they can, to keep State Beach as it is right now. Behind State Beach lies Sengekontacket Pond. This is where much of the sand from the beach winds up as it edges inland. At least since 1962, the towns have dredged the pond, returning the sand to State Beach when Sengekontacket shoals too much for shellfishing and boating. The history of dredging and nourishing State Beach makes state permitting easier than it might otherwise be for town officials. But it does not lessen the expense. On the Chappaquiddick side, none of these things is true. The Martha’s Vineyard Land Bank, a public agency, owns three tiny bits of the North Neck shore, but most of it is privately held. Unlike Sengekontacket, there is no easily permitted source from which to dredge and therefore no ready way to nourish North Neck beaches. Nor is there a highway the state cares about. What happens to this shoreline depends in large measure on how much the owners are willing to cooperate and pay for. Man only armors and resupplies shorelines where he has a direct financial investment, coastal observers say. Where the public goes to the beach, money and effort to keep them intact and in place usually follow. With houses, roads and public beaches running from East Chop almost all the way to Lighthouse Beach, it’s no wonder that where an embankment rises vulnerably along the sea, a wall of stone, wood or asphalt defends it from the hammering of storms. Or that where an inlet to a useful pond or harbor lies, a pair of jetties keeps it opened to the sound. Or that most anywhere there is a beach used by public or private landowners, there is engineering or nourishment or both. Farm Pond shoreline in 1938. At East Chop, the first effort to build a seawall around the bluffs began in 1895. The wall was built of wood, measured 960 feet long and cost more than $42,000, according to the Army Corps of Engineers. The wall was meant to protect the gabled and turreted houses that were rising on the headland as well as a seafront drive that meandered along the cliff. The revetment didn’t last. So in the spring of 1929, the state and town began building the template for the bulkhead of wood, stone and broken up roadway that lies at the foot of the bluffs today. “That has made a big difference in the downstream beaches. And it was supposed to. 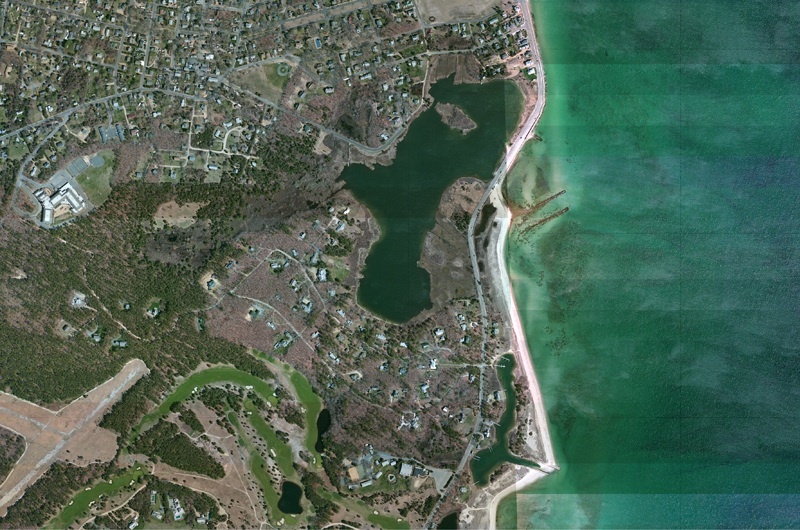 It was supposed to hold the sand and bluffs and keep it from filling in Vineyard Haven harbor. And it did that,” said Jo-Ann Taylor, coastal planner for the Martha’s Vineyard Commission. A Google Earth view down the shoreline offers dramatic, even intricate evidence of how the state and towns have tried to arrest, compartmentalize and rebalance the coast since the barricading of the East Chop bluffs in 1929. According to a study by the Vineyard Environmental Research Institute in 1980, towns and private owners built more than 40 structures along the shore between 1930 and 1950. Some are massive, such as the jetties leading from Nantucket Sound into Sengekontacket Pond at Big Bridge, first built in 1962 and lengthened several times afterward. Experts say that these jetties — along with an earlier set along another artificial channel at Little Bridge, farther north — do more than any other to reduce and deflect what sand still manages to migrate south from the barricaded bluffs of East Chop. Ironically it is at State Beach — which these two sets of jetties bisect and help to starve of sediment — where the commonwealth and two towns have spent the most money to keep the shoreline wide and in place over the last 50 years. Count the cars parked along the shore on a sunny day in July or August. Those are visitors who keep the seasonal economy moving. Left alone, State Beach would have folded inland long ago, coastal scientists say, fanning into Sengekontacket Pond and eventually converting it into a wetland, then a marsh and finally a coastal field. Remnant chunks of Beach Road might lie on the bottom, hundreds of feet offshore. Farm Pond shoreline in 2011. To return sand to the most recessive sections of State Beach, and to keep a waterway within the pond open for shellfishermen and boaters, Oak Bluffs and Edgartown first dredged Sengekontacket and spread sand along State Beach in 1962, repeating the process most recently between 2008 and 2011. They have also barged in sand from the mainland at great expense. At the section of the beach known as Bend in the Road, the towns needed to spread the sand out as much as possible to help keep it in place. They also needed help to pay for the work. Enter the Cow Bay Association, a group of landowners just south of the public beach that needed sand too. The deal was complicated and expensive, but it worked out for all concerned. Oak Bluffs dredged nearly 60,000 cubic yards of sand from Big Bridge north to Little Bridge at a cost of $1.2 million. More sand was barged in from the mainland. Sediment was spread across the public beach at Bend in the Road and neighboring private beach at Cow Bay. Edgartown provided the dredge. 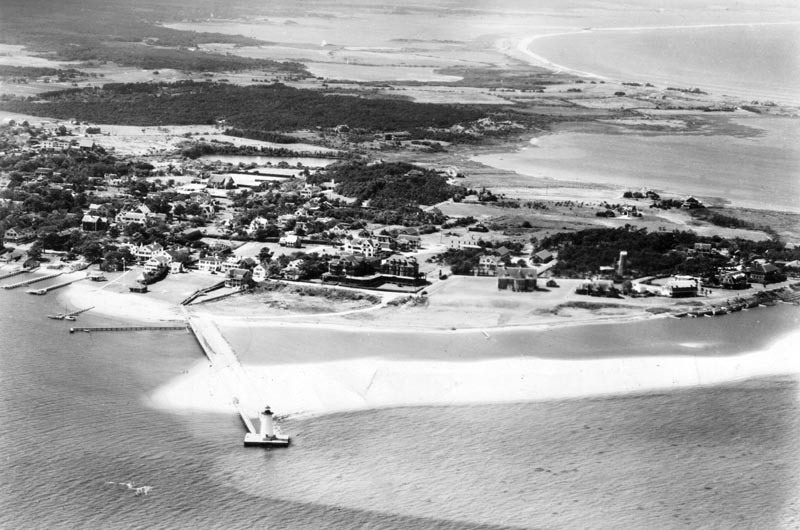 Oak Bluffs, where most of the sand came from, borrowed $500,000 to pay for the project. The Cow Bay Association and a few neighbors to the east contributed $700,000 to pay the balance, and also paid at least that much again for the studies, permitting and sampling that led up to the work, according to Mr. Cerullo. It also leased nearly 200 feet of private beach to Edgartown for one dollar per year over the next 99 years to make more of Bend in the Road public. Freshly supplied sections of beach became habitat for shorebirds. In May, the project was named one of the five best-restored beaches in the nation from the American Shore and Beach Preservation Association. This length of public and private beachfront has held up surprisingly well after the brutal storms of this past winter. But nobody involved expects the project to be a permanent solution. The coastline will continue to roll inland as the seas rise and storms strike. Going by the historic record, it might be necessary to do the job again in 10 years or less. Half a mile east of Cow Bay, a visitor who last walked the outer harbor shoreline from Eel Pond toward the Edgartown lighthouse at the end of World War II would recognize almost nothing of it today. Where once there was mile-long beach protecting Eel Pond, there is now nothing but shallow water. Where once there was open water at the entrance to the harbor there is now a vast beach surrounding the lighthouse. No other sector of the Vineyard Sound or Nantucket Sound coastline has been so completely altered by the handiwork of man in the same 70-year period. And unlike Cow Bay or State Beach, no other sector may prove more difficult to hold in place or restore to anything like the equilibrium it knew two or three generations ago. 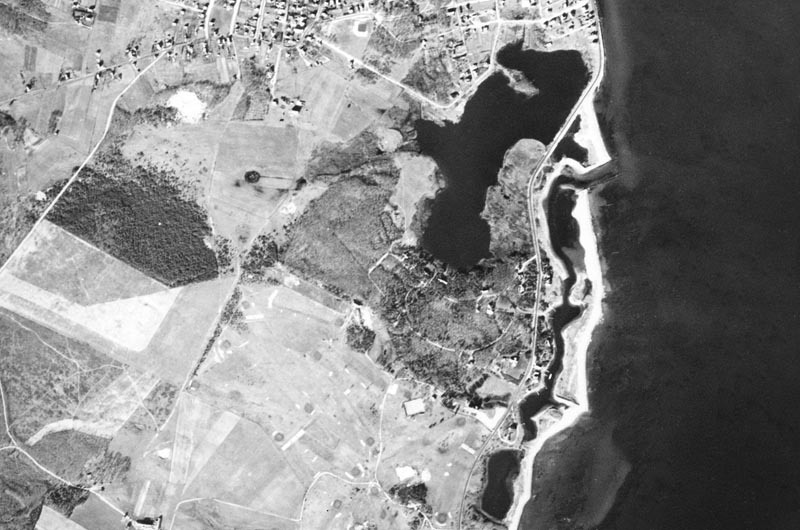 According to maps provided by the Vineyard Environmental Research Institute, until roughly 1958 the barrier beach at Cow Bay kept reaching eastward until it hooked around Eel Pond, sheltering the pond, and the waterfront houses that lie along it, from northeasters that can turn the outer harbor into an angry sea. Visitors who last saw Fuller street beach only one summer ago express astonishment at how much the beach has atrophied in the last 12 months. Steve Ewing, an Edgartown pier builder and former commercial fisherman who has spent most of his life on the waters around the Vineyard, recalls building a footbridge over a channel that lay between the end of the road and the beach decades ago. Edgartown Lighthouse was once accessed by walkway. Curving south, where the shoreline at the Edgartown Lighthouse ends at the bottom of the cell, the problem is reversed. It’s one that many towns and landowners would love to have: too much sand. Until the Hurricane of 1944 wrecked a wooden walkway that led out to it, the lighthouse stood on a concrete foundation entirely surrounded by water. “When I was a boy, you could sail right by it and touch the pedestal,” Mr. Ewing said. But after the 1944 storm, the town built a stone walkway — in effect, a 750-foot jetty — from North Water street out to the lighthouse. The breakwater was chiefly meant to shield the harbor entrance from easterly storms. But for 70 years it also trapped what little sediment managed to skitter by all the structures built along state beach to the west. More recently, sand from dredging projects in Edgartown harbor has added to the total. Today Lighthouse Beach, less than one lifetime old, a fraction of a second in geologic time, wraps around the stone breakwater and base of the lighthouse, extending some 440 feet to a point that hooks into the harbor entrance, narrowing it. Coastal geologists agree that there is no way to resupply the withered barrier spit at Eel Pond — might as well change the charts to read Eel Cove, they say. But Mr. Ewing, boaters, and town officials are concerned about the accretion of Lighthouse Beach, the narrowing of the harbor entrance and the thinning of Fuller street beach. The easiest way to address all three problems would be to pump Lighthouse Beach sand roughly half a mile northwest to Fuller street and build just one more groin to hold the sand where it’s put, said Mr. Ewing. Easier said than done. These days, the state Department of Environmental Protection rarely approves new groins along a shoreline. There is no state highway to save, no navigable waterway to keep open at Fuller street, no tradition of pumping sand there. Before the town receives a permit, the state Division of Marine Fisheries will have to agree to let sand be pumped above the high tide line at Fuller street, lest it cover shellfish habitat in the sand below the line or in the water just offshore. “On that beach, I don’t know how much sand you could put above the high water line that’s going to really make a difference,” said Ms. Taylor at the Martha’s Vineyard Commission. “So I don’t know about beach nourishment at that location, because I don’t know what sand piled above the waterline there is going to do. Mr. Ewing and other town officials hold out hope. “You’ve got marine fisheries talking about how, if you build sand back in over that beach where it used to be 400 feet out, you’re going to lose that bottom habitat,” he said. “Well, okay, look, it was 400 feet out. There’s nothing growing in it right now. Give us a break here. It’s a balance. You’re going to have the same habitat, it’s just going to be a little further offshore. There is a house at North Neck on Chappaquiddick where the corner of a porch sags over the edge of a hollowed-out cliff. No other place on the Vineyard has seen so many neighbors atop a bluff try so many individual ways to hold on to the embankment right below their houses. And the twisted wreckage of stairways, the bowing outward of bulkheads, the toppling of trees, the landslides of earth and the rattlesnake hiss of falling sand prove how abjectly singular efforts fail. Mr. Ewing has built piers and bulkheads along the Chappy shoreline for 40 years and it’s fair to say that he knows this length of it better than any other man. “Get together,” he has often warned his customers on North Neck, because a person cannot hope to save just his own property when the whole peninsula is falling back in response to the tides, storms and ever-rising sea. “And because you need to convince the state and the town, too, that you’ve come up with a comprehensive plan for the whole shore,” he said. 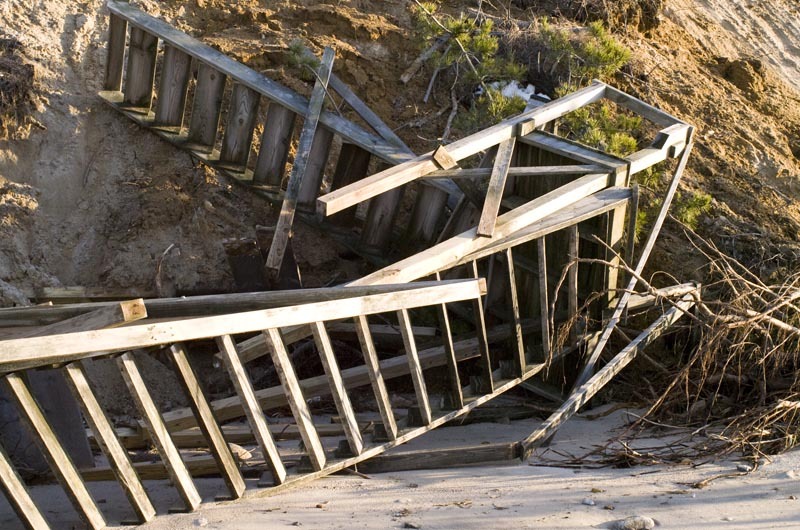 North Neck stairway tumbled from eroding bluff. In 2006 Mr. Ewing introduced Sam Fuller, who with his wife Carol owns a home on North Neck, to Leslie Fields and Tara Marden of the Woods Hole Group. For Mr. Fuller and 30 or 40 neighbors, the company did an initial survey of the outer harbor shoreline. “And we basically said the same thing,” Ms. Fields said. The homeowners could not hope to defend the bluffs and beach unless they worked together. “I think we divided it up into three different sections, where this group of 10 homeowners should consider this range of alternatives, this group of homeowners . . . should consider a different range of solutions. I think individually a few people have done things, but collectively they did not come together and do anything that we recommended,” Ms. Fields said. The challenges and costs are expected to rise. Finding offshore sources of sand acceptable to the Division of Marine Fisheries will be one challenge. Permitting new groins or other hard structures to hold the sand on the beach will be another. Determining where new sand can be placed on the shoreline will be another. Keeping up with nourishment of the beach over the decades as easterly gales and northwesterly winds move the sand and bite into the bluffs will be another. As with Bend in the Road and Cow Bay, it will likely cost millions and never end. “Ultimately, as I try and think about it longer term, I have to say, well look, it’s a beautiful place. The kids and grandkids are having a great time here. And it may be that 30 years from now, it’s gone,” Mr. Fuller said. “There’s a lot of ways it can be gone, you know,” he added. Friends down the shoreline recently loaned him The Big House: A Century in the Life of an American Summer Home, by George Howe Colt.